Imagine that you are scared, cold and hungry, on foreign turf, fighting in the trenches against an enemy that wants nothing better than to annihilate you and your comrades. Imagine that as you inch forward in battle the enemy begins to lob cylinders of gas in your direction and then follows up immediately by shooting rifle pellets directly at you filled with something you vaguely remember as being called “phosegene gas”. A sickly smell now fills the air. You are so glad that you had your gas mask on even though it is unwieldy and adds more weight to your tiring body. Now imagine that you look towards your side where your buddy is, and see that he could not reach to his belt quickly enough to put his mask on over his face so that you see that he took in a small breath of “exposed” air. Then imagine within an instant his terror stricken eyes opening wide, his face turning purple as he looks through you - and within seconds he is dead. 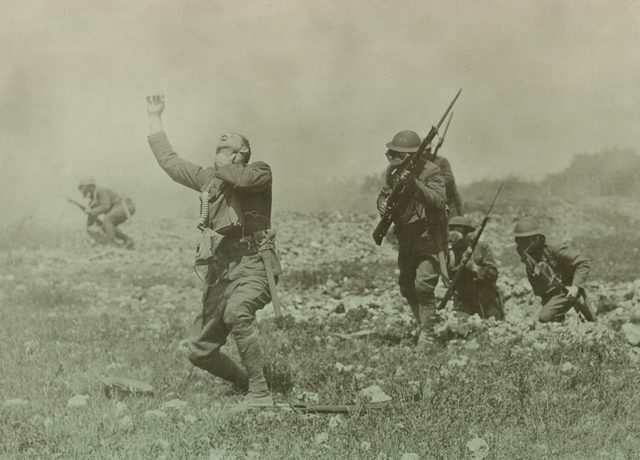 Such scenes of horror dominated trench fighting in France during World War One and three of the most influential and celebrated baseball icons of all time - Ty Cobb, Christy Mathewson, and Branch Rickey - served in a special elite unit to combat this terror, the “Chemical Warfare Service”, at the very same time in the same division during the most crucial time of the war. How was it that these three extraordinary men, none of them youngsters pining to show off their youthful mettle, would end up leaving the safety of the baseball diamond and their families and voluntarily join the service to defend their country overseas and battle the enemy in a most brutal fashion? Precious little has been written about this trio and their link in war but it is a story that reveals much about qualities of character that resonate on the ball field and in the battle field. Rickey was 38 years of age and the sole support of four young children. Matty, already retired from baseball after notching 373 victories, was also 38 years with a family. And Ty Cobb, fresh from leading the American League in batting, a feat he would do more often than any man in the history of the game, was the “youthful” age of 32. He was also the sole support of his family. Without question, all three could have easily stayed home and aided their country by using their celebrity to head war bond drives or some similar activity to raise needed capital. But the answer to the question of why they chose the Chemical Warfare Service not only reflects their obvious intense patriotism but also speaks volumes to the strength of their personal character and leadership capabilities. To fully grasp the sacrifices these men made during a time of war, one must first learn of the importance and unique role of the Chemical Warfare Service. The Chemical Warfare Service, or “The Gas and Flame Division” as it would commonly be called, was created at the height of the war to quell a growing public alarm as news of gas attacks such as described above began to filter home and soldiers on the front lines wrote their families about “gas attacks”, a deadly and virulent horror of war introduced on the battlefields by the Germans two and a half years earlier. At first, soldiers were given simple gas masks to carry as potential protection but the masks were cumbersome, ineffective, and required the men to breath through large unwieldy tubes. By 1918 the military was increasingly concerned and re-doubled efforts to meet the gas threat. After all, eight million men had died during the bloody war in just four years! During the summer of 1918, the brass hatched a plan, secret at first, to repel the attacks with a new elite fighting unit officially named “The Chemical Warfare Service”. Choosing Washington D.C. as a backdrop to heighten the importance of the plan, they gathered the most influential members of the press to break the news. They wanted news of the unit to receive the maximum amount of coverage possible not only as a way to scope out men of extraordinary leadership capabilities, but to inform the public that they would stem the frightening consequence of the German gas attacks in a most effective way. Major General William L. Sibert told waiting the press corps that the military would combat this “inhuman” form of warfare by recruiting baseball players and athletes with exceptional skill. Significantly, he also said that Armed Forces would not simply rely on the youngest members of the public to resist these attacks. He emphasized: “We do not just want good young athletes…we are searching for good strong men, endowed with extraordinary capabilities to lead others during gas attacks”. The die was cast. The “Gas and Flame Division” would only be open to men, strong of body and mind, who had proven themselves to be leaders as athletes and capable of exercising superior judgment in an emergency. Long before Tom Wolfe coined the phrase, they were looking for men with the “right stuff” and what better pool of men to draw from than baseball players who proved their leadership capabilities at the highest level of play? 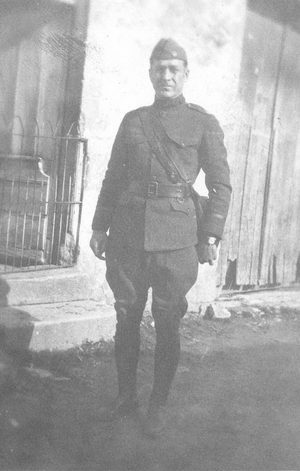 Men like Branch Rickey, who volunteered to serve in this new and important squad, would be commissioned in as a major. 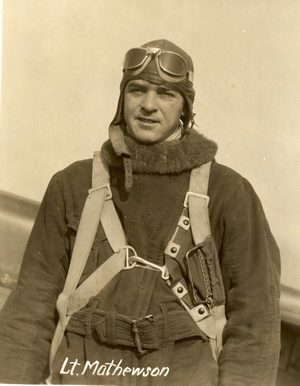 Similarly, his friends Christy Mathewson, nicknamed “The Christian Gentleman” because of his gentle ways, and the fierce Ty Cobb, already American icons, would be recruited as captains. By August all three had been accepted into the “Gas and Flame Division”. The pace of the war accelerated quickly. Within a few weeks of their acceptance, the three men’s lives intersected in a way much different than when their days were filled with baseball. 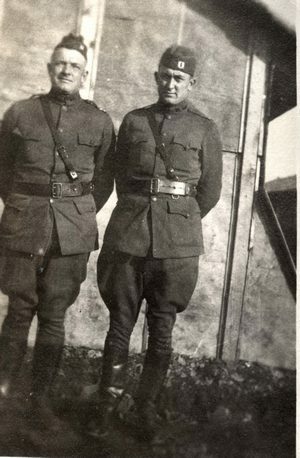 In September, Cobb and Rickey were told to immediately report for duty and secretly sail with their division to France to join others, including Matty, who had already been stationed near the front lines for weeks. The war was at a critical stage. The three were to join one another, with Rickey taking command of the unit. They were tasked to prepare for battle with special orders to anticipate German gas attacks where the heaviest trench fighting would be, then turn the tables on the enemy by quickly spraying their flanks with jets of flame from tanks strapped onto their backs. Then, once their tanks emptied they were to lob special “gas grenades” at the fallen Germans and clear the area. The men were primed! The trio’s unit had already participated in several operations supporting allied tanks and infantry. Now their ranks would swell by a fresh batch of men, including three of baseball’s best. By September the Germans threw caution to the wind and mustered as much of an attack in France as they could. The battles in the northeast of France would be the most decisive in the war. If the Germans would win, the war would continue indefinitely. Then as the “Gas and Flame Division” with their famous recruits readying for combat would learn, even preparing and training for dangerous duty could have disastrous consequences. It was during their final training run that tragedy did strike one of the three. Cobb, in his autobiography written in 1961, My Life In Baseball, graphically described what happened: “I will never forget the day when some of the men, myself included, missed the signal (to snap their mask into position). Men screamed…when they got a whiff of the sweet death in the air, they went crazy with fear and I remember Mathewson telling me ‘Ty, I got a good dose of the stuff. I feel terrible’….I saw Christy Mathewson doomed to die”. Cobb felt that his life was spared only through “the touch of Divine Providence”. Cobb was lucky. We shall see that Matty was not. But fate would have things in store for the trio other than trench warfare because as October turned to November the rumors of surrender proved true. On Armistice Day, November 11, 1918 the Germans surrendered. The bloodiest world war was finally over. Within weeks, the three, their lives changed forever and inexorably linked by their valor as military men, returned to the United States where they and countless others were met by a war weary nation wanting desperately to move on. By early 1919 Rickey re-joined the Cardinals and honed one of the shrewdest baseball minds ever. A sick and tired Ty Cobb announced his retirement but after several weeks regained his strength and decided to return to the game he loved. Cobb would play eight more years before retiring for good with a .367 lifetime batting average, the highest of all time. The consequences of the gas, however, would linger within Matty’s once strapping system. Upon his return, Matty never really regained his health. Sadly, in 1925, after a long series of illnesses, at the youthful age of 45, he succumbed to tuberculosis, his body having been compromised from the exposure to gas from his service to the country and complications inherent from his weakened system. Today all three men are enshrined in the Baseball Hall of Fame. Their leadership qualities, the very traits that enticed them to join the military elite in the “Gas and Flame Division”, resonate to this day. Ty Cobb is still widely recognized as being one of the top two or three baseball players of all time. Christy Mathewson, whose life ended prematurely because of his service in the “Gas and Flame Division”, is a beloved figure, recognized as being amongst the top pitchers ever. And the patriotic Branch Rickey’s place in our culture grows with each and every year. When he helped set the stage for the civil rights movement by shattering the color barrier, nearly 30 years after his service in the “Gas and Flame Division”, the “Mahatma” - as members of the press affectionately called him - opened the door for the equal rights for everyone. Frank Ceresi is an attorney, author and baseball historian who runs his own museum consultation, legal services and professional appraisal business. See www.fcassociates.com. This page last updated June 18, 2008.